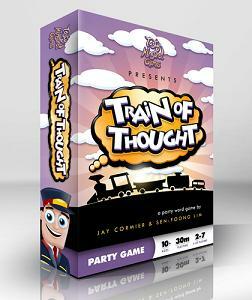 Score points by giving clues and guesses against the clock as you and your friends ride the Train of Thought! Step 1: The Conductor gives a 3-word clue. Step 2: Using words the other players say aloud, the Conductor keeps giving 3-word clues until someone guesses the correct word! Step 3: Once guessed, the Conductor picks another word and continues to get the other players to guess as many words as possible.